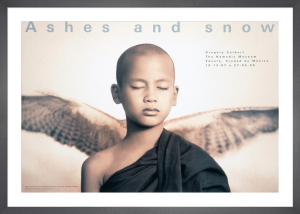 Photographer/filmmaker Gregory Colbert is the creator of the exhibition 'Ashes and snow', combining photographic artworks, films, and soundscapes, housed in a purpose-built travelling structure called the Nomadic Museum. To date it has attracted over 10 million visitors, making it the most attended exhibition by any living artist in history, and it continues to migrate around the globe with no final destination. Colbert's photographs have not been digitally collaged or superimposed - they record what the artist himself saw through the lens of his camera.